Cherry and Spoon: Minnesota Fringe Festival 2018: "A Justice League of Their Own"
Minnesota Fringe Festival 2018: "A Justice League of Their Own"
Summary: A mash-up of A League of Their Own and superhero movies, in which female superheroes are recruited to fight evil and the patriarchy. Highlights: Let me start by saying that I have very vague memories of watching A League of Their Own many years ago, and I don't watch superhero movies. At all. Because of this I probably missed about a third of the jokes (also because the 60 minutes are packed with as many jokes as Lin-Manuel Miranda musicals are packed with words, and because my brain moves considerably slower after 10 pm), but I still found this show brilliant and hilarious. 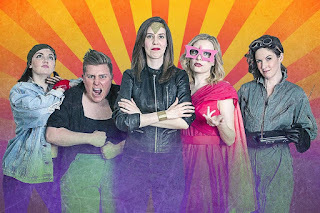 Kudos to director Josh Carson for writing (with ample help from his mostly female cast) a play that skewers the misogyny of the superhero universe and the world in general, and making it so funny and geeky too. Five awesome women (Allison Witham, Emily Jabas, Kelsey Cramer, Lauren Omernik, and Sulia Altenberg) play five awesome superheroes who, despite being strong and capable, have to deal with society's expectations of how they should behave. Heather Meyer is a superhero as well with her multiple characters and lighting fast dialogue, while Josh fills the Tom Hanks role as the past his prime alcoholic Batman hired to coach the women (with Andy Rocco Kraft and Brad Erickson playing many ridiculous roles). The entire cast is fun and playful and all around top notch. If you're more familiar with A League of Their Own than I am (I really need to watch that movie again), you might recognize some familiar scenes and themes, as well as some superhero archetypes. Like Not Fair, My Lady!, this show comes at just the right time and refreshingly shows us female characters just being (super) human. How revolutionary. Read all of my Fringe mini-reviews here. Minnesota Fringe Festival 2018: "Blood Nocturne"
Minnesota Fringe Festival 2018: "Rejection"
Minnesota Fringe Festival 2018: "Book of Shadows"
Minnesota Fringe Festival 2018: "Kaboom"
Minnesota Fringe Festival 2018: "Gunplay!" Minnesota Fringe Festival 2018: "Lakes 4"
Minnesota Fringe Festival 2018: "MEDUSA"
Minnesota Fringe Festival 2018: "My 4 Bodies"
Minnesota Fringe Festival 2018: "Eddie Poe"
Minnesota Fringe Festival 2018: "A Part of Me"
Minnesota Fringe Festival 2018: "Our Best Life"